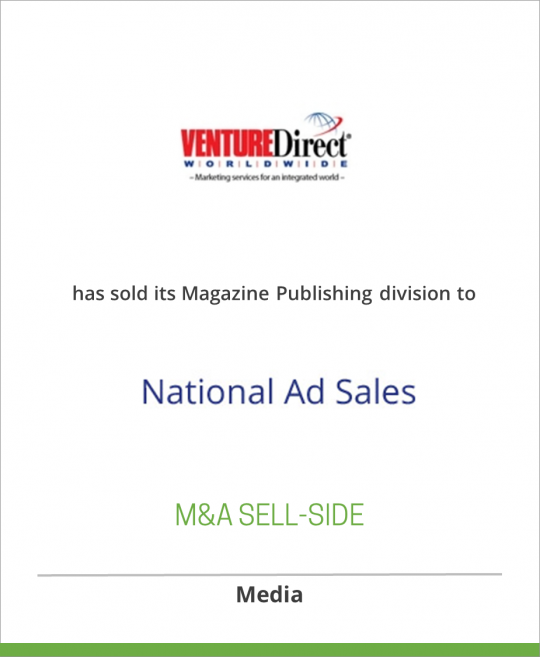 DeSilva+Phillips announces that its client Venture Direct Worldwide, an advertising and list management firm, has sold its Magazine Publishing Division to National Ad Sales, a joint venture between J.L. Farmakis, Inc. and Roy McDonald Associates, Inc., two of the oldest publishers representative firms in the country. The Magazine Publishing Division offers a full range of publishers representative services to its clients, and maintains an impressive roster of consumer and B2B magazine clients. J.L. Farmakis, Inc. is a multi-media representative firm serving publishers, broadcasters and electronics firms in the capacity of consulting and advertising sales. Incorporated in 1972, J.L. Farmakis, Inc. is one of the oldest independent rep firms in the United States and has one of the most experienced sales forces in the country with an average of over 18 years. They have been active members of National Association of Publishers Representative (Past President, Treasurer), National Agri-Marketing Association, National Association of Farm Broadcasters, Mortgage Banking Associates, and other key industry organizations. About Roy McDonald Associates, Inc.
Roy McDonald Associates is a full-service publishers representative firm serving a wide range of print and digital clients. Founded in California in 1927, Roy McDonald has had a long legacy of serving clients on the West Coast, and over the years has expanded eastward with offices in Las Vegas, NV and Dallas, TX in addition to both a San Francisco and Los Angeles office. The titles served by Roy McDonald include professional association publications, B2B and consumer publications and online publishers.